Two important appointments, in Spring and Autumn, here in Parma in the heart of Emilia and Italy, just steps away from the world, in order to choose between thousands of pieces in thousands of different styles, check out market tendencies, discover new collecting areas, conciliate business dealing with a pleasantstay in the capital of Food valley, the city of fine cuisine but also of music and art. The city of Verdi and Toscanini, the city of Parmigianino and Correggio. 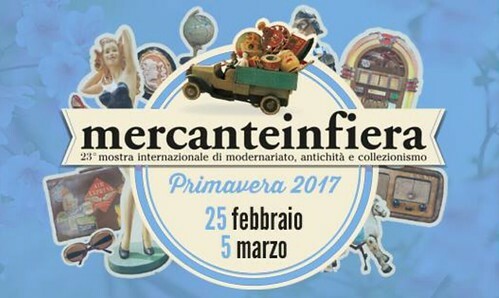 Mercanteinfiera is a true antiques city where more than 1000 exhibitoris from all the major European antiques centres come to show their prizes, their discoveries to tens of thousands of visitors, whether they be professionals, collectors or simply hunters of memories of yesteryear. This goes beyond the idea of an exchange market and becomes a glorious game for the enthusiast. A.N.G.E.L.O. as usual will attend the event with a large retail space and is waiting you for an exciting journey into the world of vintage.